Mosley leaves the Watts of Easy Rawlins and Socrates Fortlow (Always Outnumbered, Always Outgunned, 1997) far behind in this extravagant futuristic fantasy of a lucky few San Francisco natives transformed virtually into a new species by rays of unearthly blue light. When the astral visitation comes, it turns elderly housewife Eileen Martel into a tower of strength, Berkeley dropout Orde, a.k.a. William T. Portman, into a millennial prophet, spouse-swapper Claudia Zimmerman into a love goddess, and Claudia’s dog Max into a being far wiser and nobler than any human. Even marauding biker Winch Fargo, who caught only the very end of the light show, and Lester Foote, a.k.a. Chance, a half-white, half-black Bay Area historian whose blood is mingled with OrdÇ’s, receive breathtaking new powers. 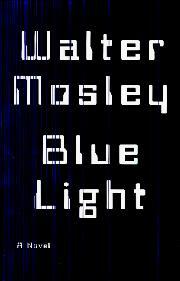 If Mosley’s premise sounds like the John Travolta film Phenomenon writ large, however, it’s both darkened and broadened by the shadow of the impending battle between the Blues and their nemesis, Gray Redstar, ne Horace LaFontaine, a hideous hybrid of blue strength and death’s fury. Once the Blues, joined by such demi-Blues as Folsom Prison warden Gerin Reed and Orde's miraculously gifted daughter Alacrity, retreat into the surrounding woods and, ringed round by killer butterflies and sentient redwoods touched by the light, give themselves over to spiritual and carnal love, Mosley’s fantasy develops distinct superhero overtones (“Alacrity was the greatest warrior in the history of the world. She was bold and kindhearted, savage and ruthless”). At the same time, the story, already heavily burdened with Chance’s oracular meditations on history, racial difference, and the intertwining of violence and love, begins to drag, as months turns into Grayless years, and to stagger under the weight of its apocalyptic premise, whose every manifestation demands a new set of superlatives. The finale is likely to leave readers as unsatisfied as Chance. The result is an ambitious mess, inventive and visionary as Mosley’s greatest admirers might wish, but torn between windy prophecy and comic-book heroics.